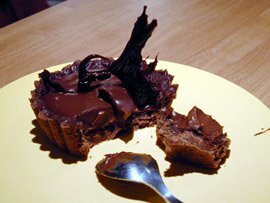 I could have met my friends Marie-Laure and Laurence at a Chocoholics Anonymous meeting, so when they came over for dinner last night, I decided I would treat them to Absolute Chocolate Tartlets. The recipe comes from one of my cookbooks, called Je Veux du Chocolat! (“I want chocolate!”) by Trish Deseine – another much cherished present from Maxence. In the book, it is called “Tarte Absolue” and is made as one big tart, but I love making single-serving things, especially desserts, and I wanted to use the little tartlet molds I had bought at E. Dehillerin two weeks ago : fluted edged, non-stick, with removable bottoms. This is a pretty time-consuming dessert to make, but it’s a lot of fun, and the result is way worth it! "Man, I'm stuffed!" said the zucchini. Last night, my BFFs Laurence and Marie-Laure were coming to dinner, and as a main dish, I served these Quinoa-Stuffed Zucchini. These small “eight-ball” zucchinis had caught my eye in the sidewalk stall of our produce store and I immediately saw, in blinking letters: Stuffed zucchini! I got nine of them as there would be three of us, and three is always a good number of items to have on a plate. I started out by cutting off each of their cute little hats neatly (reserving them of course), then scooped out the flesh, being careful not to rip the skin, with a melon baller. Let me stop for a second here and tell you about my OXO melon baller: I bought it on a whim about two years ago, and I don’t have the faintest idea why, since I don’t remember having ever felt the need for a melon balling apparatus before. I guess it just struck me as neat in the store. These things seem to happen. I did use it for the first time last summer (to ball melons, of all things), and did find that it worked beautifully! It’s pretty sharp, like a little rounded knife. Like I said: neat. The filling is a simple mix of cooked quinoa, ricotta, sautéed onions and garlic, and the carved-out flesh of the zucchini. This I proceeded to spoon into the zucchini shells, and was astonished to see that I had precisely the right amount of stuffing to fill them. Isn’t that creepy? That normally never happens, right? Kind of like when you dig a grave, and there’s never enough dirt to fill it back in? OK, forget I said that. Anyhow, my zucchinis were stuffed to the brim, and I put the lids back on. I did try to return each hat to its rightful owner, but they had gotten mixed up, and I figured they were probably past caring at that point. This is a lovely dish that you can prepare in advance, and pop back into the oven when your friend get there. And Marie-Laure and Laurence were very appreciative indeed. “C’est vraiment délicieux!” they said. First, cook the quinoa. Bring 360ml (1 1/2 cups) water to a simmer. Add the quinoa and simmer, partially covered, for 10 minutes. Remove from the heat, cover, and let rest for at least 10 minutes; a little more is fine. The grains will continue to unfurl and plump up during this time; it will have absorbed all the water and won't need draining. Slice a "hat" off the top of each zucchini, and carve the inside using a melon baller or a sharp-edged teaspoon, reserving the flesh. Put the zucchini shells and hats in a baking dish. Drizzle with olive oil, sprinkle with 1/2 teaspoon salt, pepper, and 1 teaspoon herbs. Put into the oven for 20 minutes; this will give the zucchini shells a head start on the cooking. 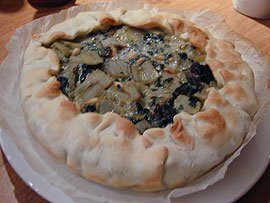 Meanwhile, heat a glug of olive oil in a large skillet, and sauté the onion and garlic for 5 minutes, stirring regularly, until soft and fragrant. Add in the cooked quinoa and pine nuts, and mix well. Take the zucchini shells out of the oven. If some cooking juice has pooled at the bottom of the shells, flip to pour out (the zucchini shells will be hot). 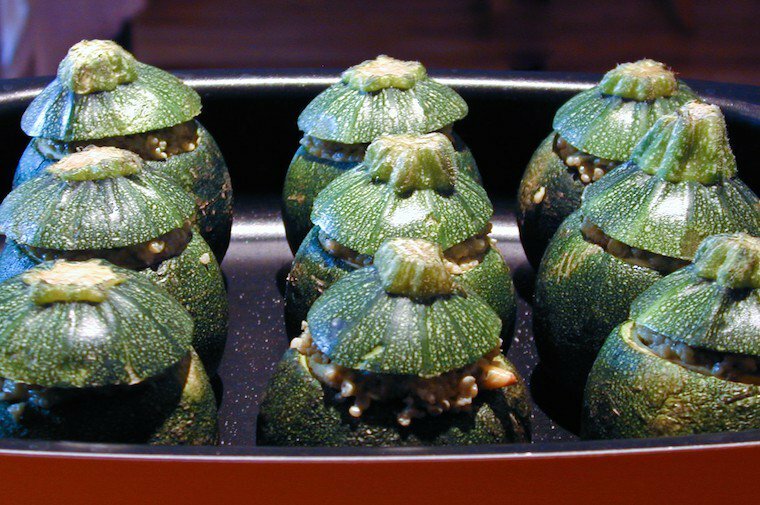 Divide the filling evenly among the zucchini shells and place the hats on top. Serve with a fresh grating of Parmesan, if desired, and green salad. 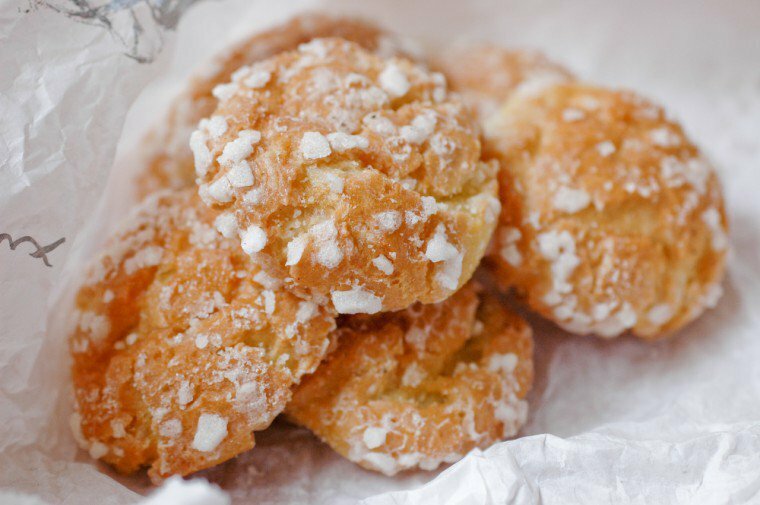 Chouquettes are little puffs of choux pastry, sprinkled with pearl sugar. They can be bought by the weight in French bakeries, in a thin bulging paper bag. When you’re a kid, the best part is eating the sugar crystals that have collected at the bottom of the bag when the last of the chouquettes has been devoured. The proper way to do this is lick your index finger and gently pick up the crystals (be warned, you may have to fight your sister for them), until the sugar is crushed too finely and you give up, then just pour the remnants directly into your mouth, shaking the paper bag to get it all. Chouquettes are also one of my boyfriend’s favorites, and he can tell you which bakeries around his office or in our neighborhood have reached the best standards in quality chouquettes. When you’re a kid, the best part is eating the sugar crystals that have collected at the bottom of the bag when the last of the chouquettes has been devoured. Having recently, and to my great delight, found a bag of the special pearl sugar that chouquettes require, Saturday afternoon found me happily setting forth on the project of making my own sugar puffs, sort of following the recipe given by this great cookbook Maxence (who knows me oh-so-well) gave me for my birthday last year, called “Les Gâteaux de Mamy” (Grandma’s cakes). I say “sort of” because I did compare this recipe with others I found on the web, and changed a few things around based on their recommendations, like I usually do. The first batch was submitted to the test of the in-house expert, who declared them yummy. He did say they were a little moister and eggier tasting than bakery-bought chouquettes, and I decided that this was because they were a little undercooked, as our oven seems to run a little colder than it says (note to self, buy an oven thermometer, find out if this is true and quit complaining). Some websites recommended to leave them to cool down a little in the turned off oven, but I am Jack’s lack of patience, and I couldn’t resist taking them out right away, which did cause them to deflate a little (no incidence on taste, of course, just looks). So the second batch was baked at a higher temp and for longer, leaving them inside for a little while this time. (The instructions below reflect this method.) This batch turned out to be just what our tastebuds hoped for : slightly crusty yet tender little pillows that melt in your mouth, contrasting with the delicously crunchy sugar crystals. UPDATE 1. Below is a revised recipe, as it appears in Clotilde’s Edible Adventures in Paris, my book on Paris restaurants and food shops. UPDATE 2. I have slightly improved upon the recipe with a couple of tricks: I now sprinkle the baking sheet with pearl sugar so the chouquettes are more evenly studded, and I brush the raw chouquettes with a sugar syrup to form a slight caramelized crust on top, and help the pearl sugar adhere. 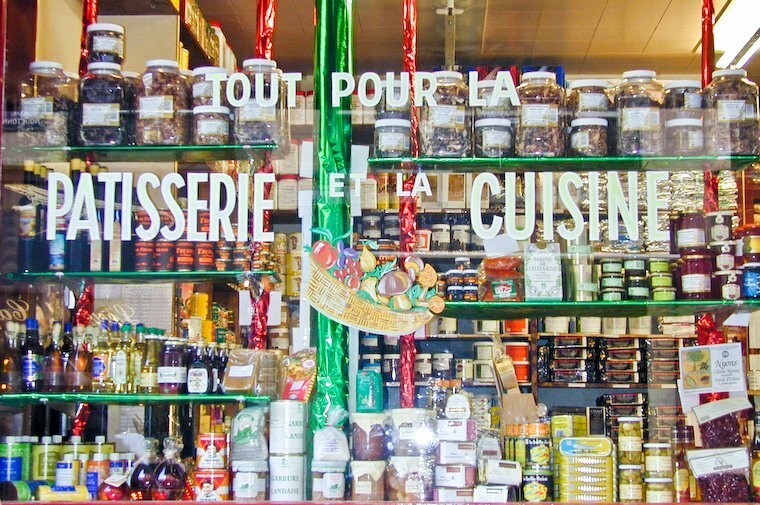 Last weekend, while I was in the 1st arrondissement buying kitchenware, I remembered my grandmother telling me about a professional baking supplies store she used to go to when she still had four sons to feed at home. The store is called G. Detou, which happens to be a pun: “G. 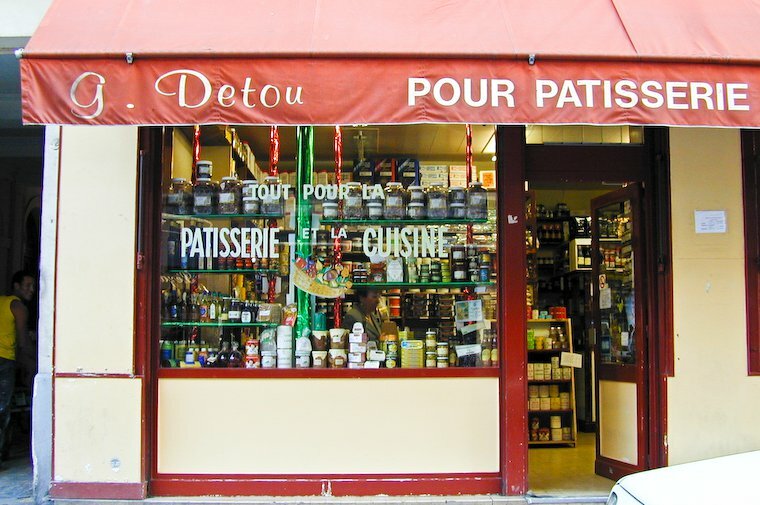 Detou” is pronounced like “J’ai de tout“, which means “I have a bit of everything”. I couldn’t remember where the shop was so I looked up the address, and I was amazed when I finally located it, right in the middle of rue Tiquetonne, which I’d walked up and down countless times without ever noticing this jewel was there. I really don’t have an explanation other than that there is magic at work here — you know, this little nook of a place that thou shalt see only if thy heart is pure and thy desire to buy baking supplies in bulk is earnest.